Serving areas: We serve the Atlanta, GA metro area. We offer free delivery to Norcross, Berkeley Lake, Duluth, Tucker, Lilburn, Lawrenceville, Chamblee, Doraville, North Atlanta, Johns Creek, Dunwoody, Sandy Springs and Roswell Georgia. 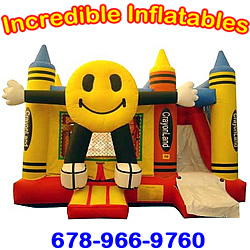 Incredible Inflatables rents moonwalks, combo units, slides (wet & dry), obstacle courses, Bungee Run, Joust, Bouncy Boxing, tables, chairs, tents and concession equipment (cotton candy, snow cone and popcorn) for birthday parties, special events, holidays, day cares, church events, fundraisers, festivals, etc. We deliver fun!